Curtis Mathes had a proud heritage. After all, it was founded in 1899, many years before most of its competitors were in business. Through these year CM has had many exclusive "firsts" to its credit. Gradually these achievements have been recognized and by the year 1967 its sales had grown tenfold. That is one way to say that sales were up over 1,000%. In all of these years there had been no achievement more remarkable than the Curtis Mathes Modular Construction of 1967. Many people today will ask "what is it?" It was not a printed circuit board that can be removed or a pug in transistor. In brief, the Exclusive CM Module is a total color television system. 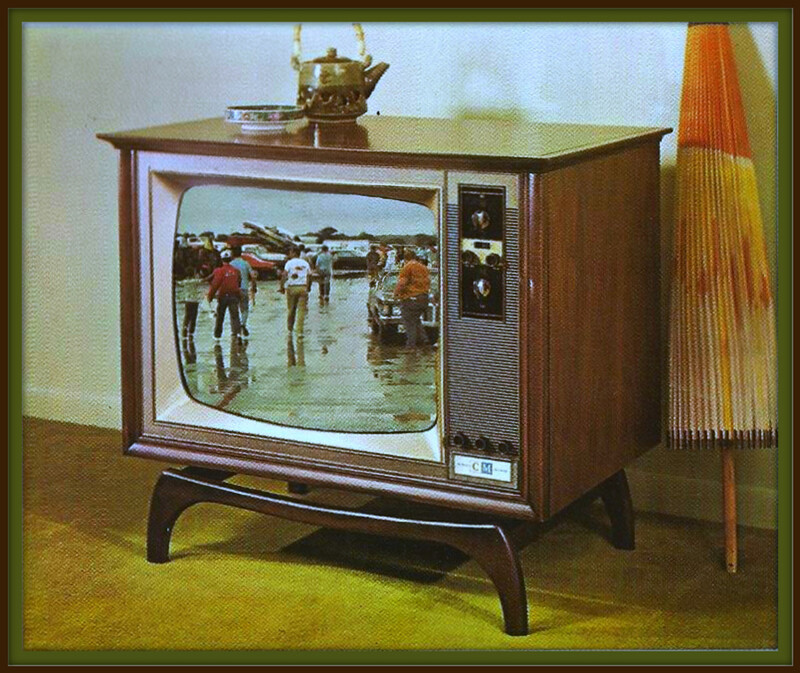 It is the entire television set, encased in rugged steel. 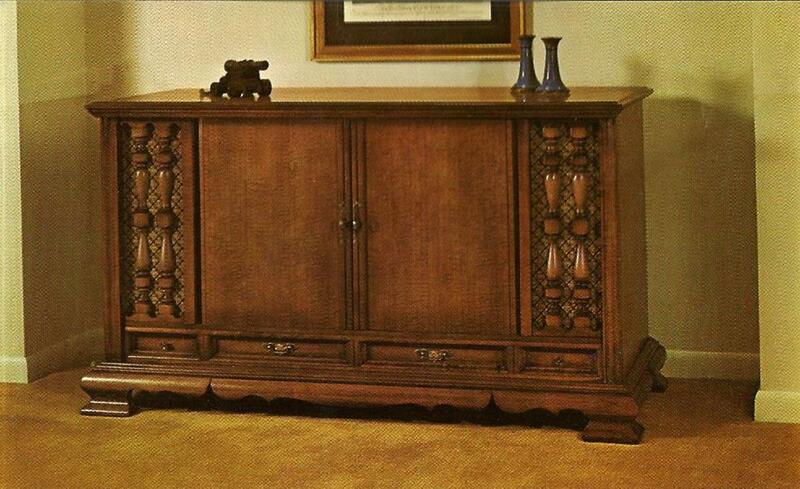 It is inserted on nylon runners into a tremendous assortment of incredibly lovely cabinets. 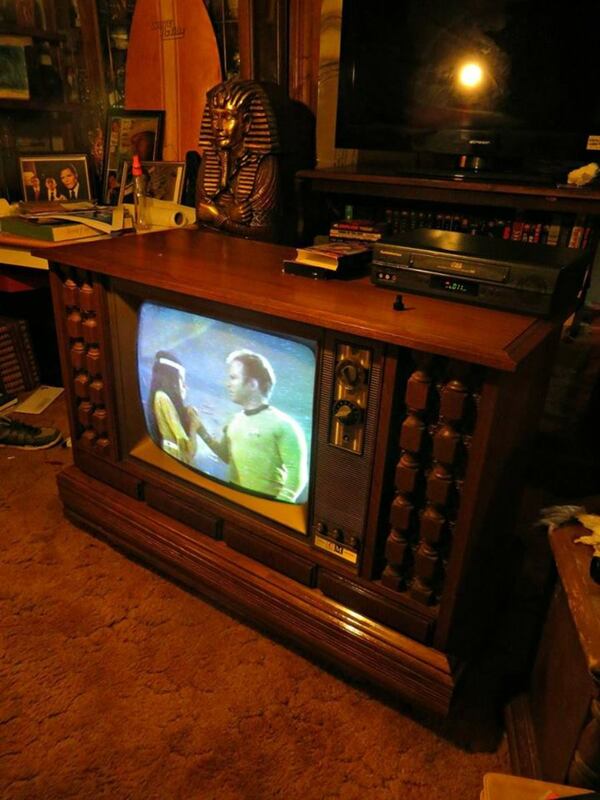 It is the entire television set, encased in rugged steel. It is inserted on nylon runners into a tremendous assortment of incredibly lovely cabinets. 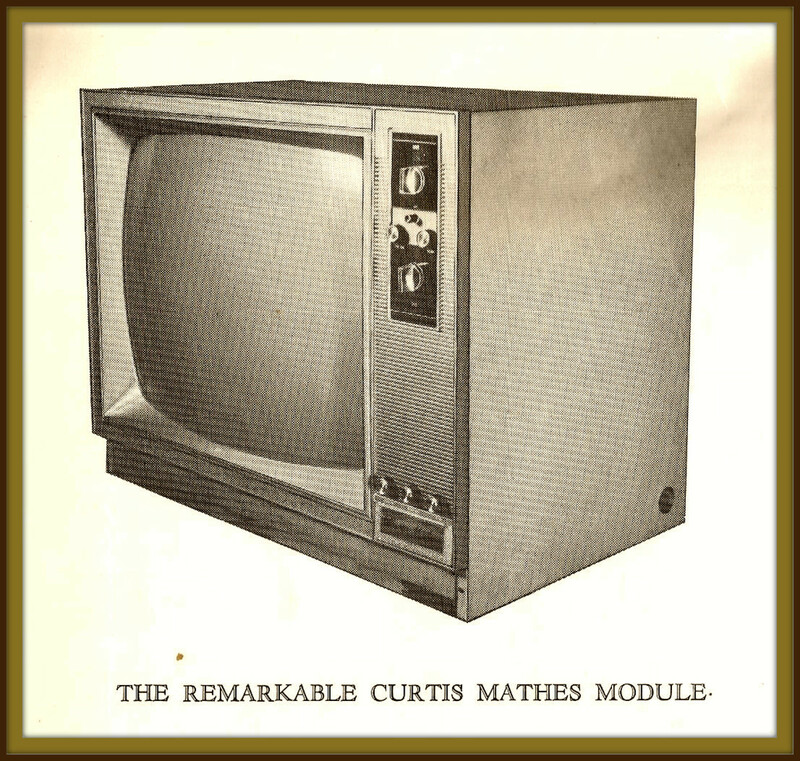 More on the Curtis Mathes module ... By being able to select from five CM modules, form splendid basic color television to the two star module, to the unbelievable luxury of the six star module, a customer back in 1967 could custom build the set of their dreams. Select the cabinet, then choose their electronics. Obviously a steel cabinet bolted securely inside a splendid furniture cabinet cost more to build than the old fashioned construction employed by all their worthy competitors back in 1967. But economy is more than the manufacture's cost. 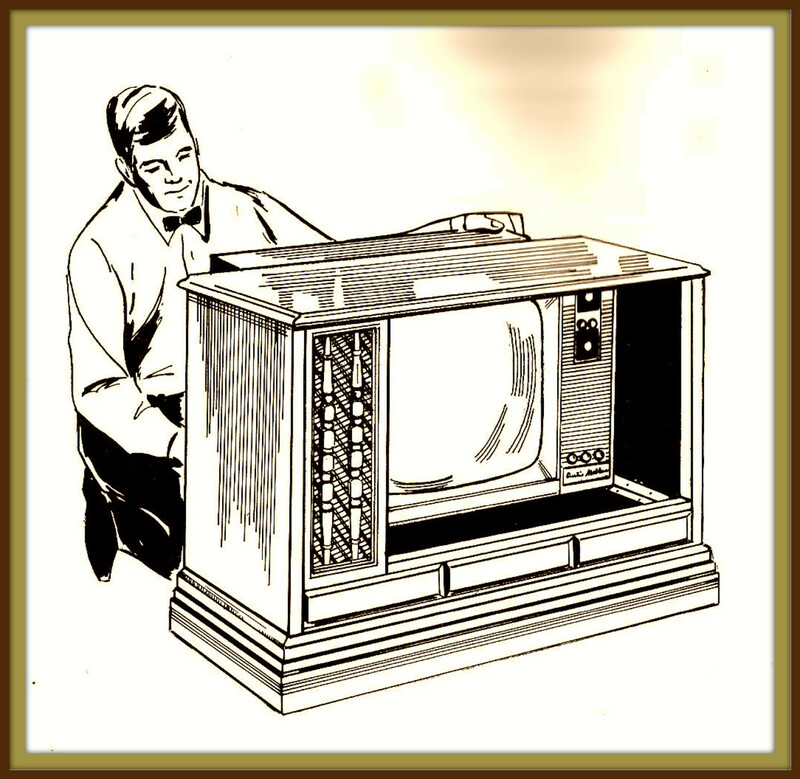 Have you ever heard of any color television set in all of time that had never required a single service call? The CM Module sips out for total service. Why check but one part of the set? The beautiful and heavy cabinet need never leave the customers home to be subjected to the bruises and bumps of outrageous service trucks. It was the peace of mind and certainty was a comfort to know that the picture tube and all the hundreds of delicate electronic parts are surrounded on four sides by steel. But if one will reflect a moment, could the customer of 1967 rest assured that the "state of the art" is at its zenith or, let us say, it's high point? Clearly times will continue to change ... and with Curtis Mathes' remarkable record of achievement ... ultimately there will be a scientific breakthrough of such magnitude as to tempt even a CM owner. 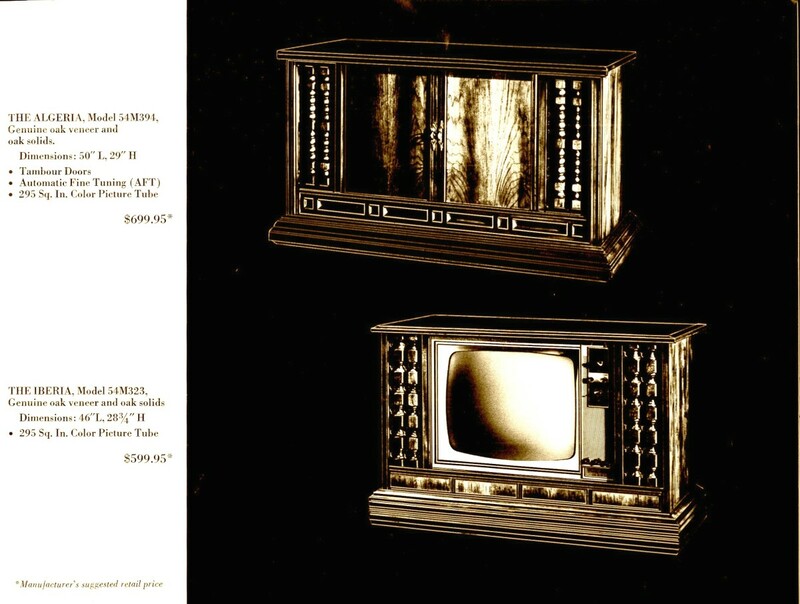 For example, back in 1967 there was talk of holography with the possibility of three dimensional television. 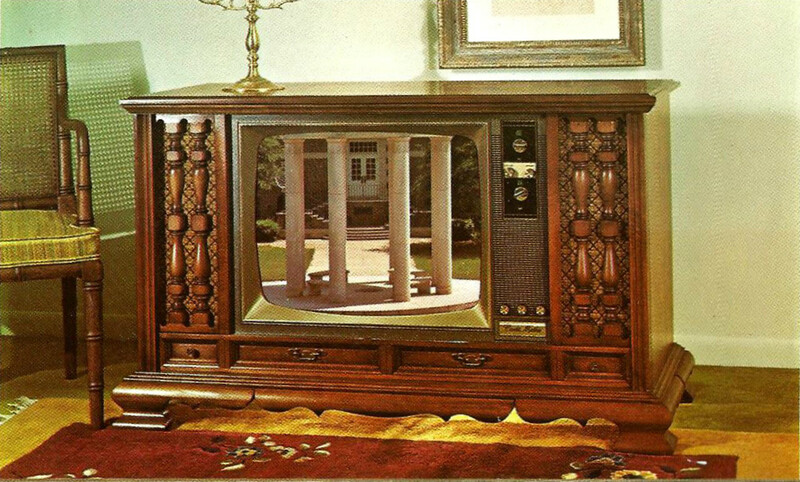 It was a marvelous thing to realize that with the Curtis Mathes Modular Program you would be able to keep your cherished heirloom cabinet and insert in it the module television of the future! 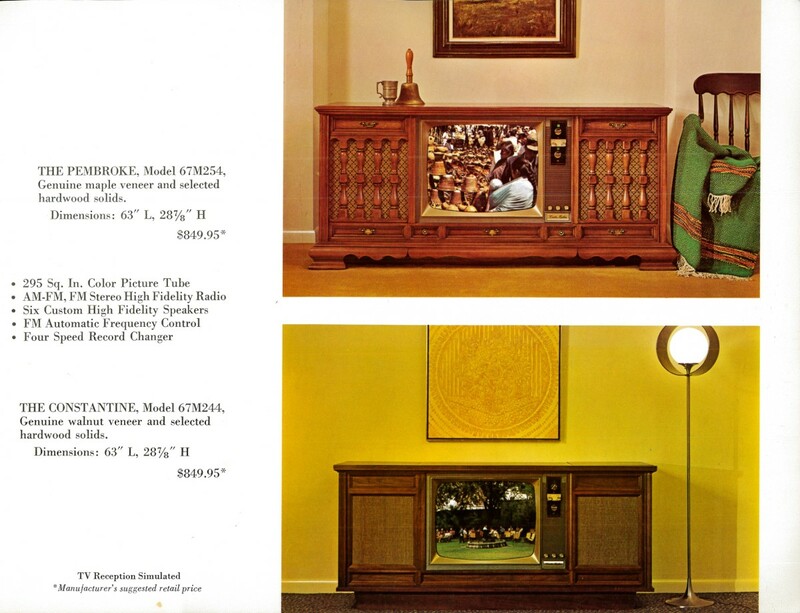 It was a marvelous thing to realize that with the Curtis Mathes Modular Program you would be able to keep your cherished heirloom cabinet and insert in it the module television of the future! 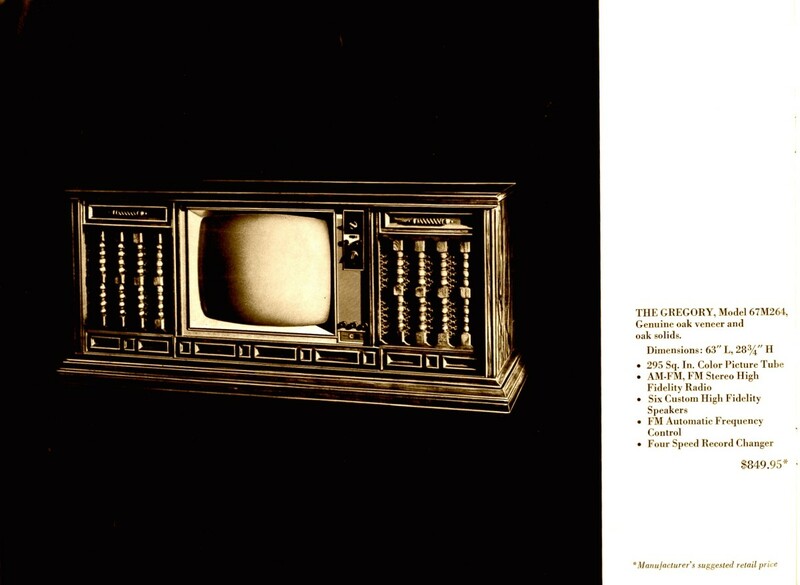 The Exclusive Curtis Mathes Module of 1967 was a total color television system. 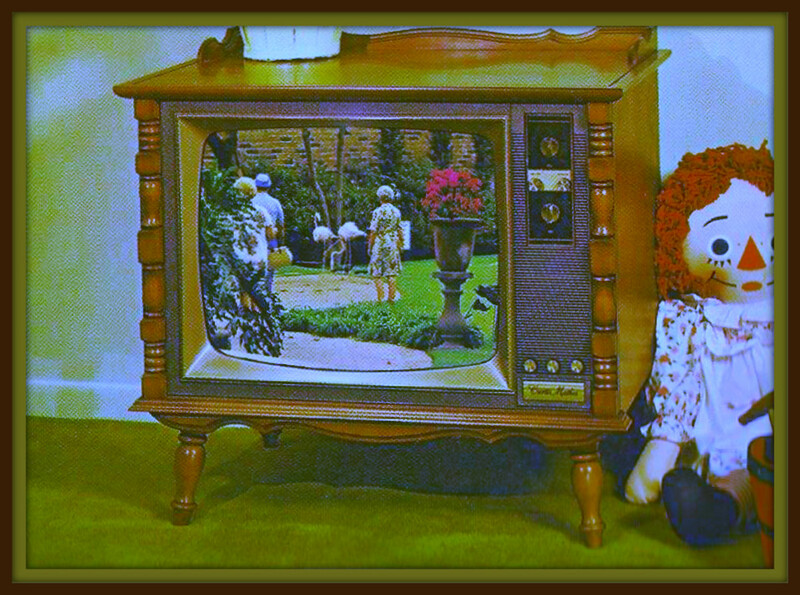 It is the entire television set, encased in rugged steel. 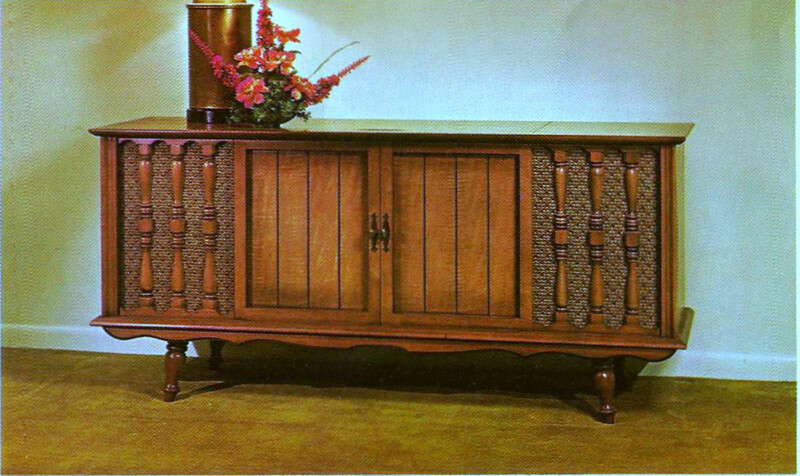 It is inserted on nylon runners into a tremendous assortment of incredibly lovely cabinets. 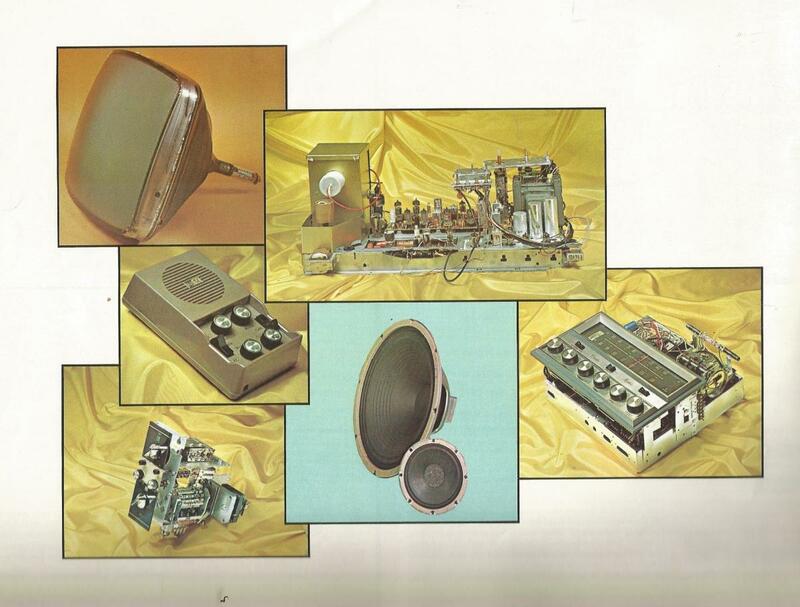 In 1967 Curtis Mathes built most of its own components, cabinets, speakers, transformer, coils, chassis, fly-backs, circuit boards, face masks,etc. This was done for several reasons. First, it gave much more control over the overall quality of the finished product since all theses parts are built to complement each other .... not just bought indiscriminate and assembled. This assured the customer of a perfectly matched unit. Secondly, by building all of these components, Curtis Mathes saved about 30% of their cost by not having to pay the manufactures' profit. This principle is carried through even to the building and printing of their own shipping cartons. 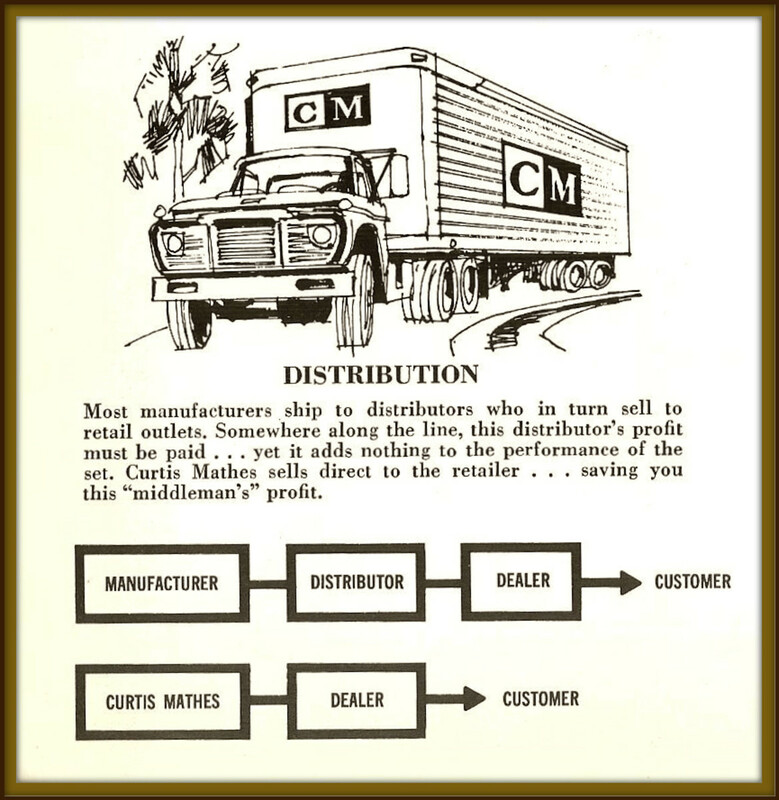 Most of Curtis Mathes competitors in 1967 bought almost all of these parts, either form outside manufacturers or wholly owned manufacturing companies, both of which must operate at a profit, thereby increasing their cost. Curtis Mathes passed these savings on to their customers bring them better value and the rest was used for more ridged and extensive quality control .... assuring folks of the most dependable Home Entertainment instruments in America. Curtis Mathes in 1967 built most of its own components. By building all of theirs components Curtis Mathes saved about 30% of their cost by not having to pay the manufacturers profit. This enable Curtis Mathes to give their customers better value ... and more ridged and extensive quality control ... assuring their costumers the most dependable Home Entertainment instruments in America. 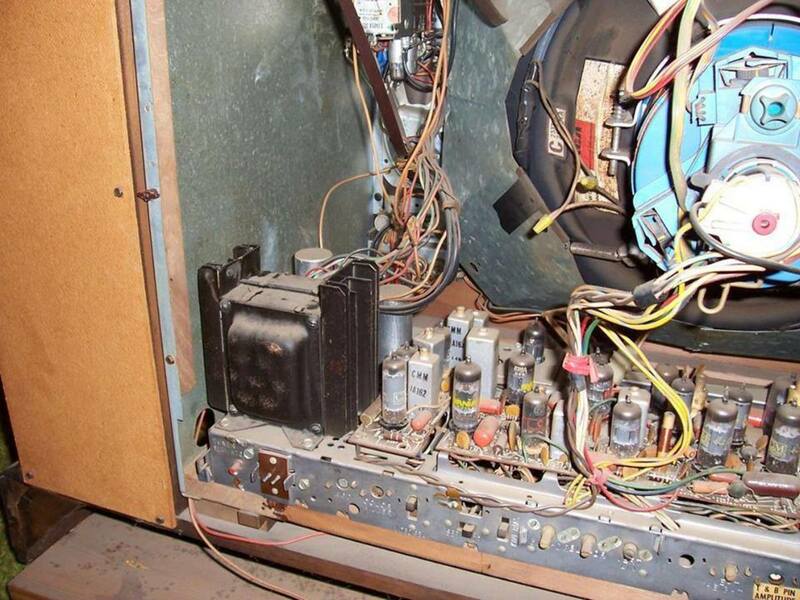 In 1967 Curtis Mathes built most of its own components, cabinets, speakers, transformer, coils, chassis, fly-backs, circuit boards, face masks,etc. 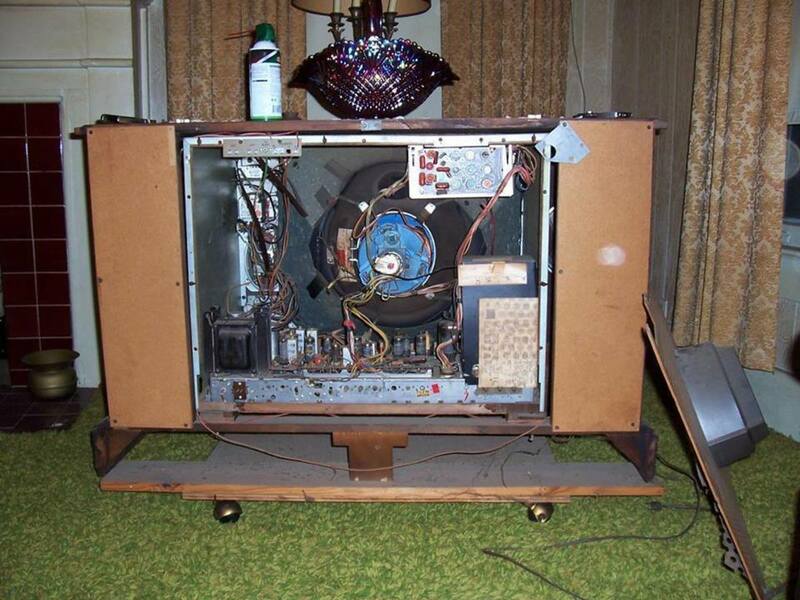 In 1967 Curtis Mathes build most of its own components, cabinets, speakers, transformers, coils, chassis, flybacks, circuit boards, vacuum tubes, and the the CM Module, a total color Television. 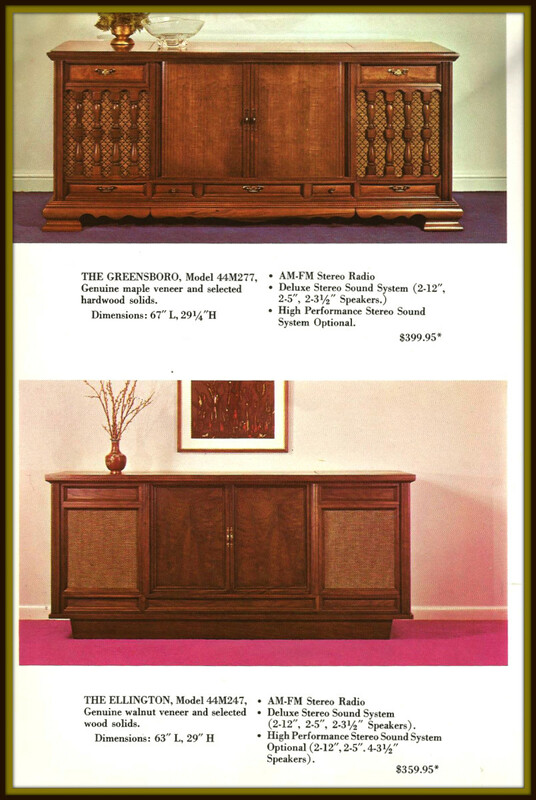 295 square inch color picture tube, AM - FM High Fidelity Radio, Six custom high Fidelity speakers, Tambour Doors, Automatic fine tuning AFT, FM stereo for concert hall realism, FM automatic frequency control, four speed record changer. There was a very good reason why Curtis Mathes actually did have the last word in 1967. 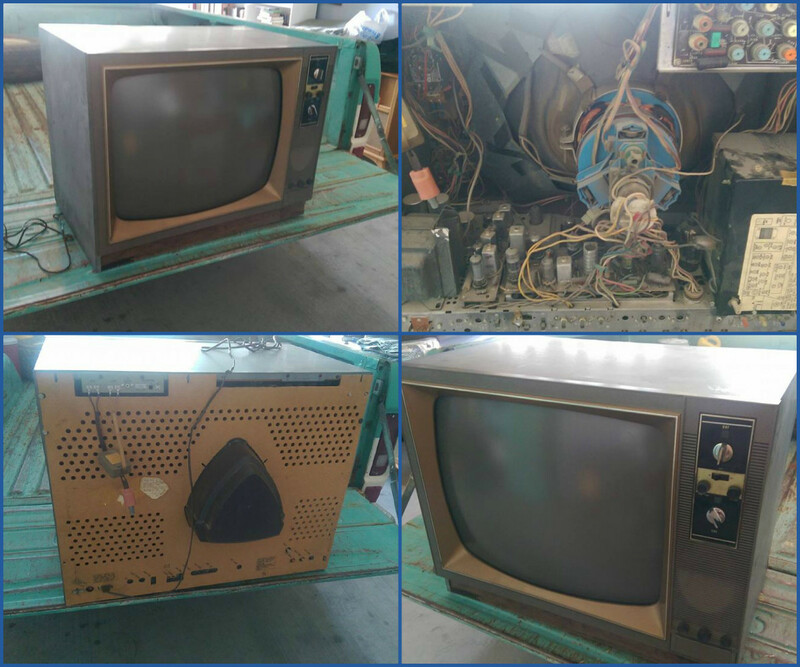 Its color television chassis assemblies were manufactured by Curtis Mathes of Puerto Rico, Inc., and this firm had a remarkable advantage: It is the only tax free color factory in the world. This meant they could give customers more for less. They did not advertise one or two features and state that they would make all other sets obsolete, they did not take a single feature automatic tint control and showed commercials on faces with flesh tones. and they did not presume to say that grouping various feature would constitute anything approaching totally automatic televisions. In 1967 the Curtis Mathes owner had come to expect the finest. Certainly they had all the desirable features. But, most importantly, they did have them all in nearly every price bracket, not just at the top of the line. A look at the Steel Encased Chassis of the Iberia, Model 54M32 the Curtis Mathes color console made from 1967 to 1968 just before the Moon Landings. with a 295 square foot color picture tube. The Curtis Mathes Iberian, Model 54M323 made in 1967 ... still working as good today as it did back in 1967. Built to last for countless years. Another look at the insides of the Iberia model, Dimensions 46 inches long, and 28 3/4 high both have a 295 square inch color picture tube, and fine tuning. 295 square inch, color picture tube, AM - FM duplex radio, FM stereo High fidelity radio, six custom high fidelity speakers, FM automatic frequency control, four speed record changer. Curtis Mathes in 1967 had lower overhead because they had lower plant locations cost. Curtis Mathes' plants were located out of expensive metropolitan areas. Better Labor Cost because Curtis Mathes payed top wages in their market ... giving them access to the best available personnel ... thereby having more dedicated and conscientious workers. 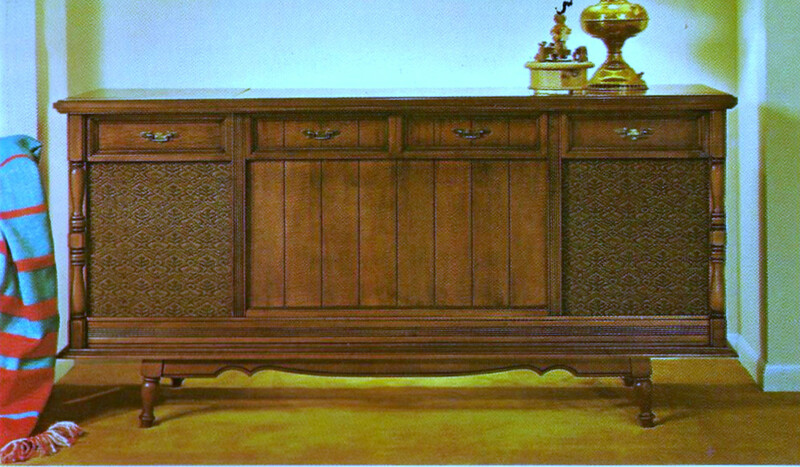 The Algeria, Dimensions 50 inches long and 29 inches high, with Tambour Doors. 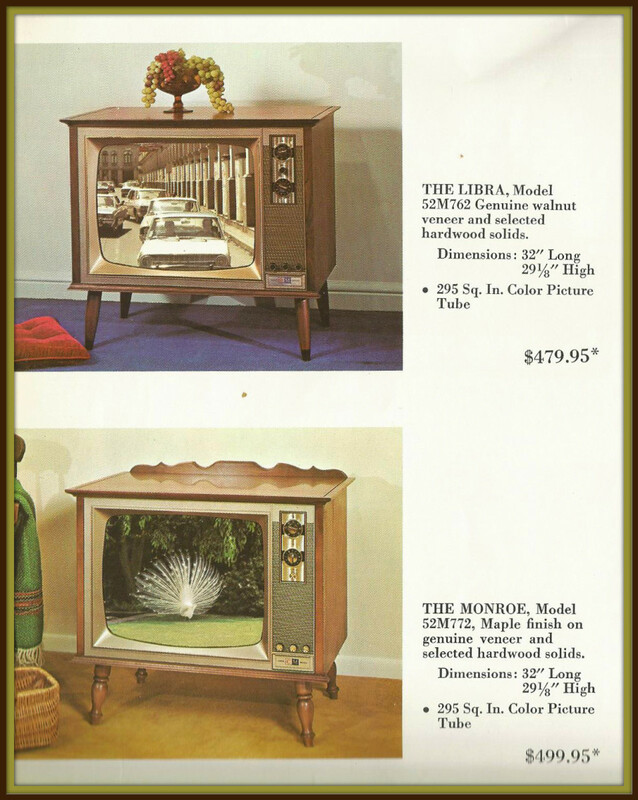 The Iberia, Dimensions 46 inches long, and 28 3/4 high both have a 295 square inch color picture tube, and fine tuning. 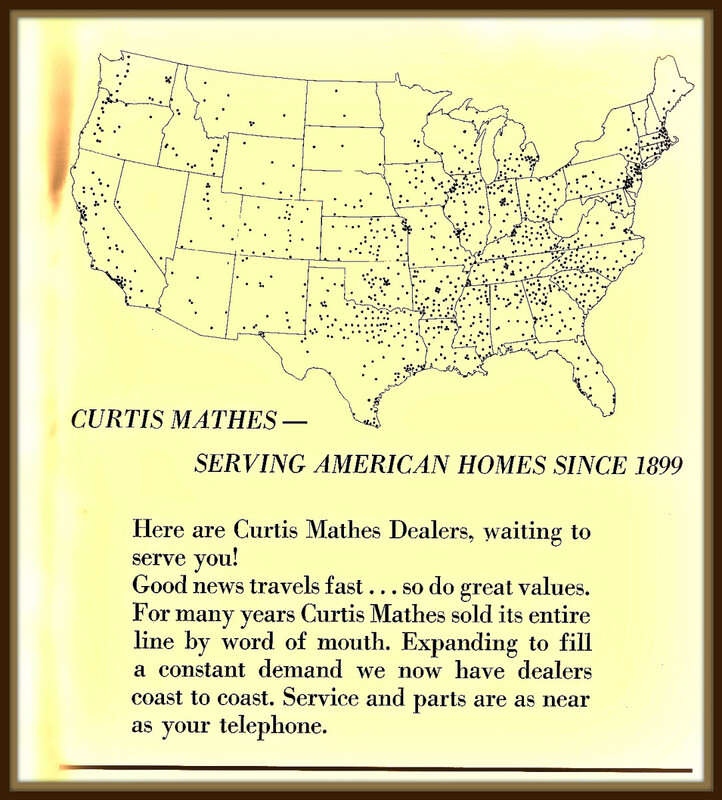 Look at all the Curtis Mathes Dealers, waiting to serve customers back in 1967. Back then good news traveled fast. 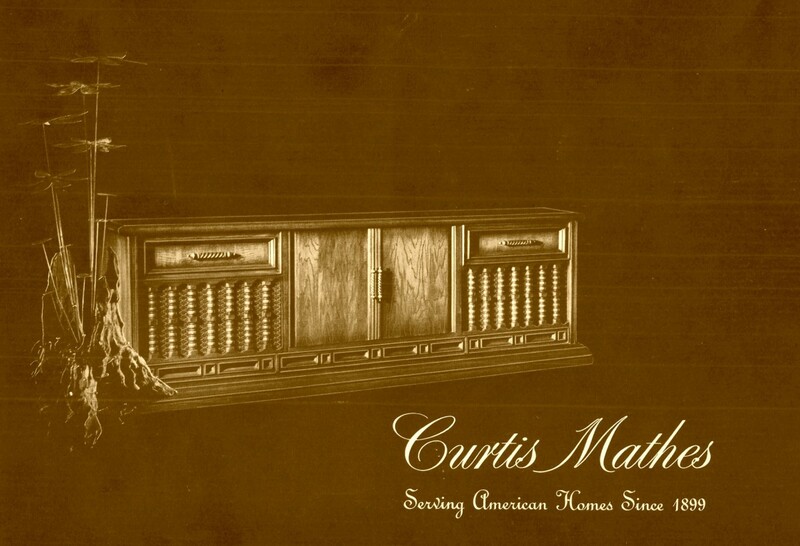 For many years Curtis Mathes sold its entire line by word of mouth. The Greensboro, Model 44M277, Genuine maple veneer and selected hardwood solids. Dimensions 67 inches long 29 1/4 high ... The Ellington, Model 44M247, Genuine walnut veneer and selected wood solids. Dimensions: 63 inches long, 29 inches high. 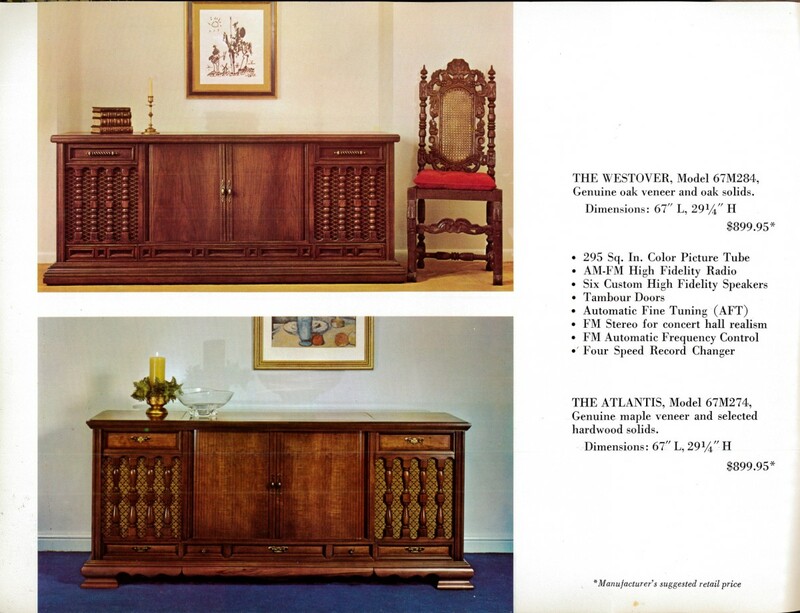 Look at a Curtis Mathes Cabinet in 1967 and you will see the work of the fourth generation furniture makers who still took pride in the craft. In the space age there were some things that Curtis Mathes still cling to form the past. One of these is fine workmanship. 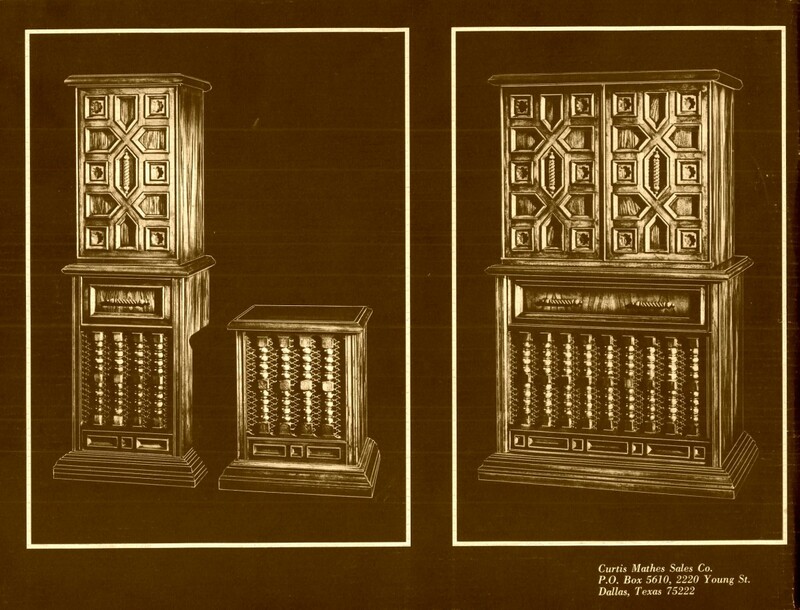 Look at these Curtis Mathes Cabinets. 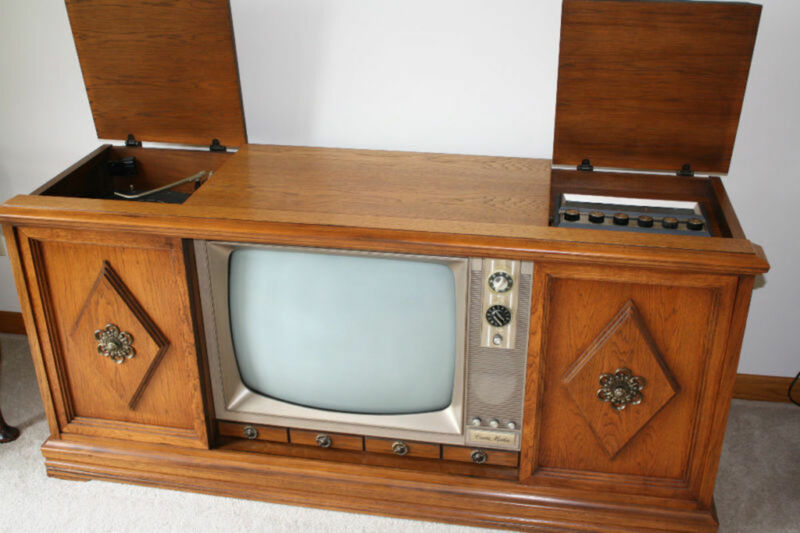 A Beautiful Curtis Mathes three in one color television console from 1967. 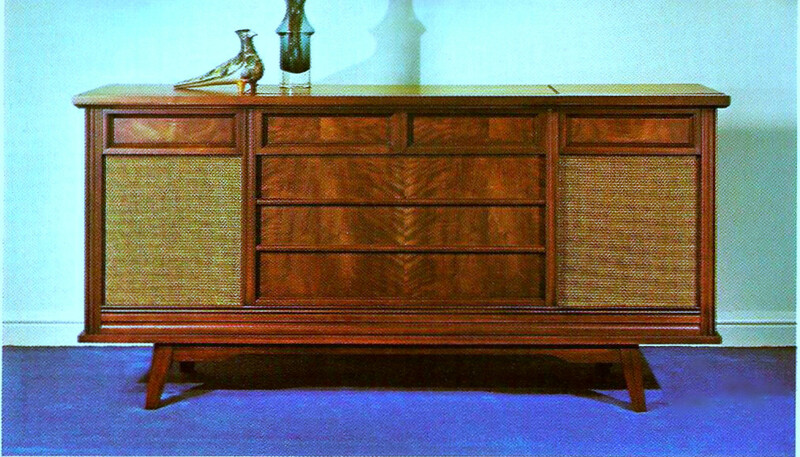 With a deluxe AM & FM Curtis Mathes Stereo system and turntable. With hand made in Texas speakers and hand rubbed wooden cabinet. The Columbine, model 44M310, Genuine Maple veneer and selected hardwood solids. 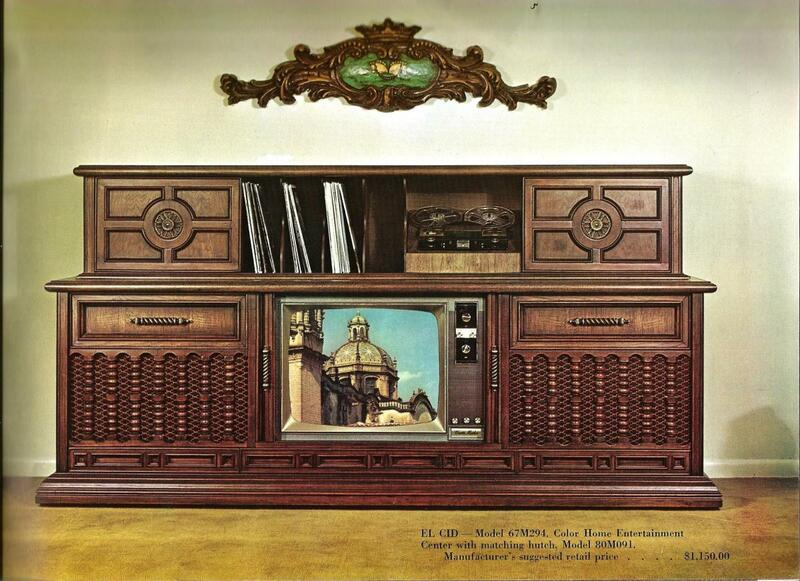 Dimensions: 62 inches long, 30 3/4 high, with custom stereo sound system and four speakers. Retail price $249.95. 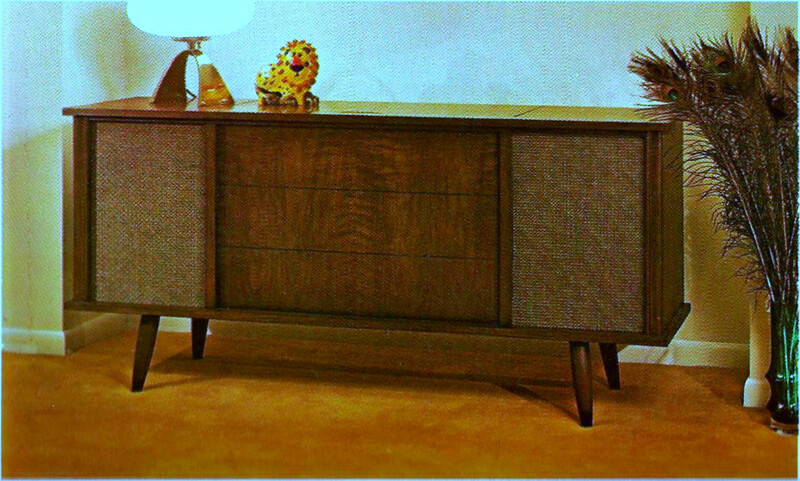 The Waverly, Model 40M779, Genuine walnut veneer and selected wood solids. Dimensions are 60 inches long, and 28 inches high, with custom stereo sounds system and four made in Texas speakers. $199.95.